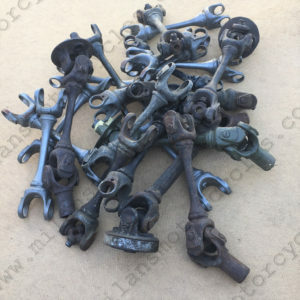 These are original, spare driveshafts and driveshaft parts for the Harley Davidson, 1942 XA, WWll experimental military model. The before and after photos are amazing and the process has a very practical purpose. The final result is like new. The first pictures below are before “as found”. The last picture is after restoration and cadmium plating. Note that the bottom middle driveshaft is from the factory +2” longer. History shows that in 1943 a few additional XAs were built with the engine positioned two inches forward in the frame. This modification meant the driveshafts had to be extended by two inches. This is one we found a couple of decades ago. 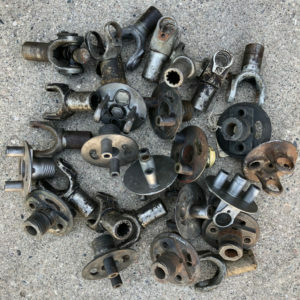 Some of these parts, shafts or eventually complete assemblies will be available for sale with prices ranging from $10 (bolt) – $1950 US, depending on the part, condition, partial or complete assembly. PLEASE NOTE: prices may change, as quantities go down. Cadmium plating is widely used in some applications in the aerospace, military, and aviation fields. Cadmium plating (or cad. plating) offers a long list of technical advantages such as excellent corrosion resistance even at relatively low thickness and in salt atmospheres, softness and malleability, freedom from sticky and/or bulky corrosion products, galvanic compatibility with aluminum, freedom from stick-slip thus allowing reliable torquing of plated threads, can be dyed to many colors and clear, has good lubricity and solderability, and works well either as a final finish or as a paint base. 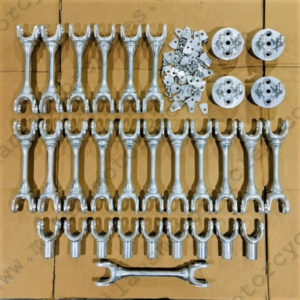 If you do not see what you need on our website, please connect with us here http://milansmotorcycles.com/contact/ with your list of parts required and we will do what we can to help you out. We offer various forms of payment including PayPal, for International clients and E-transfer or Credit Card for Canadian customers. Taxes/duties/shipping are dependent on your location and will be additional costs along with a transaction fee as required. That rare, elusive part you have been waiting for may be one call away!